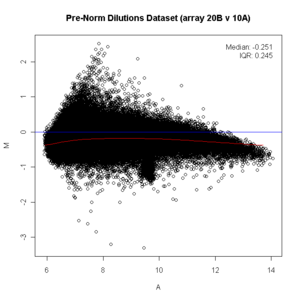 An MA plot is an application of a Bland–Altman plot for visual representation of genomic data. The plot visualizes the differences between measurements taken in two samples, by transforming the data onto M (log ratio) and A (mean average) scales, then plotting these values. Though originally applied in the context of two channel DNA microarray gene expression data, MA plots are also used to visualise high-throughput sequencing analysis. Microarray data is often normalized within arrays to control for systematic biases in dye coupling and hybridization efficiencies, as well as other technical biases in the DNA probes and the print tip used to spot the array. By minimizing these systematic variations, true biological differences can be found. To determine whether normalization is needed, one can plot Cy5 (R) intensities against Cy3 (G) intensities and see whether the slope of the line is around 1. An improved method, which is basically a scaled, 45 degree rotation of the R vs. G plot is an MA-plot. The MA-plot is a plot of the distribution of the red/green intensity ratio ('M') plotted by the average intensity ('A'). M and A are defined by the following equations. M is, therefore, the binary logarithm of the intensity ratio (or difference between log intensities) and A is the average log intensity for a dot in the plot. MA plots are then used to visualize intensity-dependent ratio of raw microarray data (microarrays typically show a bias here, with higher A resulting in higher |M|, i.e. the brighter the spot the more likely an observed difference between sample and control). The MA plot uses M as the y-axis and A as the x-axis and gives a quick overview of the distribution of the data. 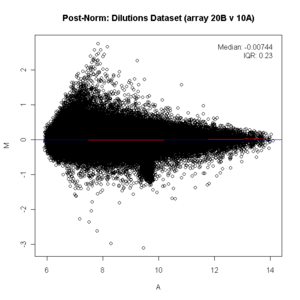 Similar "RA" plots can be generated using the raPlot function in the caroline CRAN R package. ^ Robinson, M. D.; McCarthy, D. J.; Smyth, G. K. (11 November 2009). "edgeR: a Bioconductor package for differential expression analysis of digital gene expression data". Bioinformatics. 26 (1): 139–140. doi:10.1093/bioinformatics/btp616. PMC 2796818. ^ Love, Michael I; Huber, Wolfgang; Anders, Simon (5 December 2014). "Moderated estimation of fold change and dispersion for RNA-seq data with DESeq2". Genome Biology. 15 (12). doi:10.1186/s13059-014-0550-8. ^ YH Yang, S Dudoit, P Luu, DM Lin, V Peng, J Ngai, TP Speed. (2002). Normalization for cDNA microarray data: a robust composite method addressing single and multiple slide systematic variation. Nucleic Acids Research vol. 30 (4) pp. e15. This page was last edited on 18 June 2018, at 17:59 (UTC).